Standard CPU with cheap thermal paste and large spacing between CPU and IHS. Delidded CPU with Liquid metal as thermal paste and less space between CPU and IHS. 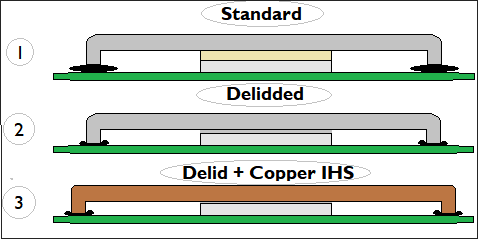 Delid + Copper IHS, even less space between CPU and IHS and greater surface area on top of IHS. Come in with your CPU personally in Søborg, or send it and get it delidded, in a safe way. It takes about 1 hour. If your CPU is brand new, check if it works before shipping. Packages must be properly wrapped. We make sure your CPU will be securely wrapped and shipped to you with Track & Trace. The CPU will be set to dry under pressure for 4 hours before it is sent to you. The Integrated Heat Spreader (IHS) is removed from the CPU using methods that are completely risk-free and complete damage-free (delid tools). Modules and connectors on the CPU board are coated with liquid electrical tape. Intel's standard thermal paste is replaced with Thermal Grizzly Conductonaut (Liquid Metal) which is the absolute best thermal paste for delidding. The Integrated Heat Spreader (IHS) is sealed in place with high temperature silicone glue and is sealed with the correct pressure. Silicone glue is not permanent ie. The CPU can be delidded again if desired. The Delidding Service is compatible with all INTEL and AMD CPUs that use thermal paste between the Silicon chip and IHS which includes a number of popular CPUs that are included in the following codenames and product names: Ryzen 2 APU, Intel Ivy Bridge, Haswell, Devil's Canyon, Broadwell, Skylake, Kaby Lake and Coffee Lake CPUs. Temperature improvements vary depending on the specific CPU. Temperatures on a overclocked can provide a variation of temperature improvements between 5 ° C to 25 ° C.